Gary Lineker's taxpayer funded salary is absolutely insane! The salaries of the BBC’s highest-paid presenters and pundits have been revealed, with Match of the Day host Gary Lineker earning more than £1.75million. The former England player earns much more than BBC Sport’s next highest earner, his Match of the Day co-star and fellow ex-striker Alan Shearer, who is paid between £400,000-449,000. Is it fair that he and other BBC taxpayer funded employees are paid more than the Prime Minister of the United Kingdom? 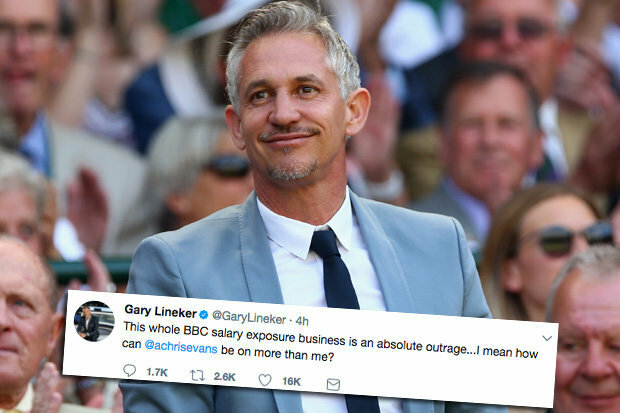 The 56-year-old Lineker’s salary is second only to Radio 2 presenter Chris Evans’ pay of £2.2-2.25 million, this does not include their own personal earnings. Lineker also earns millions from outside sponsorship work including £1.5 million from Walkers crisps where he showed little sympathy when hundreds of workers were made redundant and he callously blamed it on the Brexit vote. Lineker also recently caused outrage with an unprovoked attack on Brexit supporting fishermen describing them as 'slippery, smelly and slimey'. Lineker has called Brexit Britain a ‘dystopian land’, telling his 5.8million Twitter followers the decision to leave the EU makes him ‘feel ashamed of my generation’. He also said peoples attitudes to refugees can be ‘hideously racist and utterly heartless’, he also encouraged bosses at Walkers to pull advertising from news outlets he disagrees with over the subject. Read: "Madeleine McCann Investigation Twist"